Is it Christmas without Bourbon Balls? Soak your balls with shots of whiskey! Fa-la-la-la-laaaaa, la-laa-la-laaa! ‘Tis a treat to make us frisky! Fa-la-la-la-laaaaa, la-laa-la-laaa! Balls of chocolate laced with bourbon, Fa-la-la-la–la-la-la–la-la-la! Packed with nuts and a wee more bourbon! Fa-la-la-laaaa–la-la-la-la! Where I first heard of bourbon balls or how these chunky chocolate nuggets became a part of my personal Christmas traditions are mysteries lost in the fog of Yuletides past. All I can honestly offer today is that it is not Christmas around the cave until the bourbon balls roll out. Two branches stem from the bourbon ball tree. One is kin to a cookie while the other is decidedly candy, both sharing deep Southern roots. The candy traces back to 1919 when Ruth Hanly and Rebecca Gooch began a candy-making business in Frankfort, Ky. Long about 1938 Hanly combined their highly popular chocolate with Kentucky bourbon whiskey to create a confection the recipe for which remains a guarded family secret of the Rebecca Ruth Candy Co. to this day. These are not MY bourbon balls. 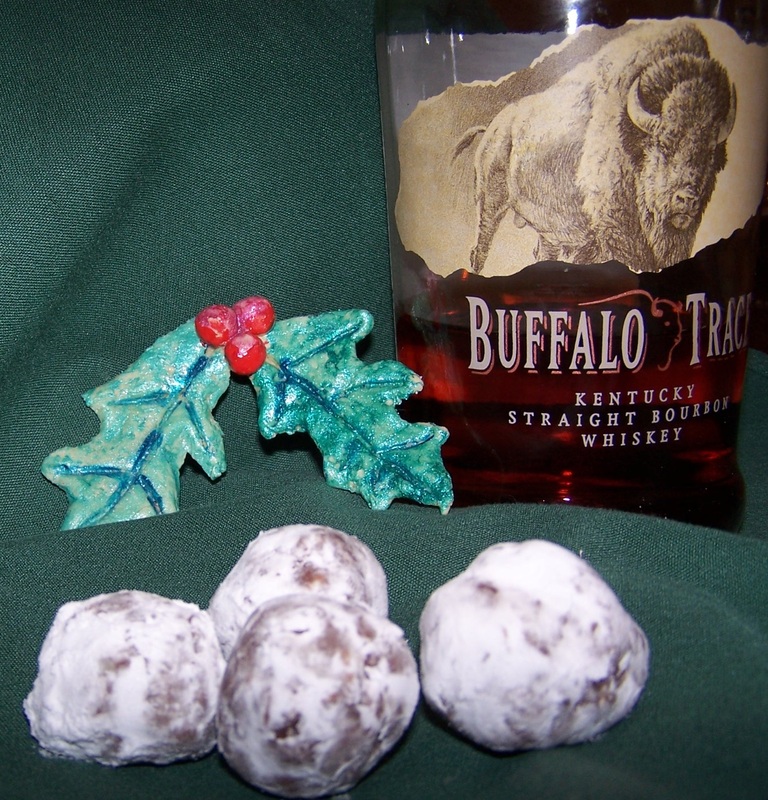 My bourbon balls are more cookie than candy, and recipes for these easy to make adult treats abound throughout the South. Not even GOOGLE, however, could provide a hint to their origin or history. Traditional bourbon balls begin with vanilla wafers. Non-traditionalists may opt for shortbread cookies, ginger snaps, graham crackers, Oreos (do you really want to scrape off all that cream center? ), etc. Heck, I’ve even pondered experimenting with Ritz crackers, but truth be told, I’ve not yet gotten far enough into my cups to try that variation. Start with a double handful of cookies. If you tend toward lazy, dump ’em in a food processor or blender to reduce the cookies to fine crumbs. I prefer to double-bag ’em in plastic baggies and beat the crap out of ’em with my trusty rustic wooden rolling pin. This hands-on method will not produce the crumb uniformity of machine processing, but I feel SO much calmer when I’m done. Also, I prefer the more rustic, non-uniform crumb size. Begin the batch with at least a healthy cup of crushed cookies in a large mixing bowl. Some folks prefer to bump it up to two cups of crumbs for a tamer product. You will have to experiment to find your particular comfort zone. To the crumbs add two tablespoons of unsweetened cocoa powder, 1/2 cup of powdered sugar and a generous cup of finely chopped nuts. Mix well. Being a Southern concoction, pecans are, of course, the traditional nut of choice here. Free-thinking lefties, on the other hand, have been known to use hickory nuts, walnuts, hazel nuts, chestnuts, what have you. I’ve even heard rumors of some die-hard tree huggers using pine nuts, but that does get costly in a hurry. Whatever the nut you decide to go with, they will benefit from toasting before chopping, but that’s fodder for another blog. The heart and soul of the bourbon ball is the whiskey. Bourbon whiskey. GOOD bourbon whiskey which comes from Kentucky. If you would not let it pass your lips straight, don’t put it in your balls! As you can see, my personal choice is Buffalo Trace (No, I do not get kickbacks from the distillery, but I remain open to offers!). Must one use bourbon whiskey? Well, yes, if one wants to make bourbon balls. However, you can use rum instead if you have a hankering to put some rum-pa-pum-pum in your Christmas celebrating. Same rule of quality applies. So fetch down a small glass bowl in which to blend 1/4 cup of fine bourbon (yes, or rum!) with about a tablespoon and a half of light corn syrup. What happens if all you have is dark corn syrup? I suppose your balls will lean to the dark side, I do not know. Nor have I played with honey or molasses, although I am considering it. Use your own judgement. Have fun! Thoroughly combine the bourbon/corn syrup mixture into the dry ingredients in the larger bowl. Incorporate it completely, then cover the dish with plastic wrap and put it in the fridge to stiffen a bit. Half an hour should do it, but it will not hurt to let it sit longer. When you are ready to roll your balls, sift about a cup of powdered sugar into a pie pan. Take about a heaping teaspoon or two of the mixture, form it into a ball and roll it in the sugar. Coating the balls in sugar retards alcohol evaporation, so do not omit this step! Seal the finished balls in an air-tight container, return them to the fridge and forget about ’em for at least a couple of days. Most purists will age them at least a week, but whose got that kind of will power, right? Take your balls out of the fridge and let them come to room temperature before serving. You also may want to roll them one more time in powdered sugar before presentation. Hi – interesting article. It reminded me of the first time I made “rum balls”…..it was in college and they were so bad, students were throwing them and having rum ball fights! Great memory now, not so much then! 🙂 Thank you for sharing! Thanks, Sally! I have not experimented with rum. Ever since I tried to drink my dad under the table way back in ’71, I have not been able to look Cap’n Morgan nor any of his mates in the glass without my stomach turning.